If anyone is interested in joining the team, please send an email. Any English --> Japanese translators would be great. I've made a banner for the project! Feel free to use it as your forum signature or slap it on your website/blog! Spread the word on the project! Let Mayuyu feel the foreign fans' love too. The more fan submissions, the better. GO, GO, GO! can i send photo + letter ? Yes, please do! All submissions are welcome. 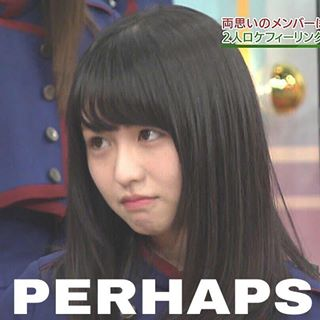 Umm, I have a friend on another forum who likes Mayuyu so much can they send something to you? Yes! Submissions from anywhere are welcomed! Just send it to the email address. Hello....I am from Indonesia, I wrote the message should use English or Indonesian? I always thought that Mayuyu is such a cute child, but now i don't think its appropriate..
''Do you know why the snow is white? Oh yeah, Mayu’s Birthday is about 3 month from now. Better if we think about it. I saw very beautiful gift from Haruppis fans. Nice idea, nice effort. I hope we can come up with the better ideas than that or yeah at least something similar like that. It almost holidays so for now better to just use it for refresh our mind. I would love to talk it with you someday. Or yeah, invite me if you want to make a project. I would love to be a part of that. Yes, 20 is the important "coming-of-age" year so it would be nice for us foreign fans to do something. The Haruppi fans had a graphic designer amongst them which is why their book turned out so beautiful. 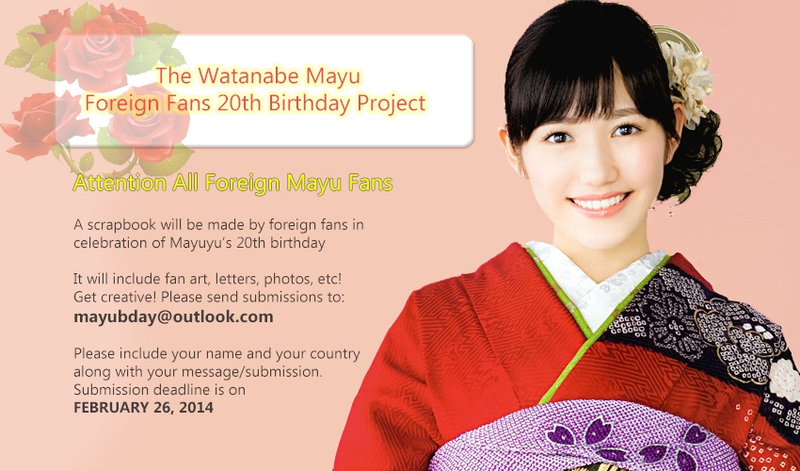 It would be great if the Mayu fans could think of something to do. And perhaps we could liaise with the Japanese birthday committee to join in their projects. I remember the Japanese Yuko birthday committee also had an English section of their website for foreign fans to join in. I'll ask the member of the committee who is active to reach out to the English-speaking fanbase about what they are doing/whether we could participate or whether the foreign fans want to do a supplementary thing. Hai Jul3 and everyone. I’m back. I’m so sorry, I had some problems and activities which made me away from internet, though actually not really away, in some occasion i could open the browser and uploaded some of my creation to tumblr through queue feature. Sorry, I just couldn’t focus. I feel guilty, i’m the one who started the conversation but i ended up leaving without say something. So, it seems that you all have started the project. Scrapbook isn't it? I want to help but i don't know what kind of help i can do for this project. Is there something i can do for this project? I’m familiar with graphic design though my skill is not that good. Hehe. But i’m confused because Scrapbook is a handmade isn’t it? So it basically doesn’t need design from computer. Em... maybe if you dont mind could you give me a little explanation about it? Like what kind of scrapbook you want to make, the size, the theme/idea, etc. Maybe i can help in making the template or at least giving you an idea. Sorry. Oh ya, I read that you also want to make a T-Shirt. If in the end you decide to make it, I think I can help in making the design. Maybe you can tell me the theme/idea or what kind of t-shirt you want to make or maybe we can talk about it together. I will try my best to make the design. Actually i’ve made a T-Shirt design (simple design) and another one which is still in progress. Yeah if maybe you are interest. I probably will send it to that email later. Em.. I’m sorry i don’t know if this is the right place to talk about that or not. Maybe i should send email. Like you, i also want to give my support to Mayuyu. As per PM, please send your google+ to us so you can join the community/discussion team. Thanks! btw Is it alright if we write the message on three language? example: Native, English and then Japanese? as long as they fit on the birthday's card?